﻿ Download/Read "Terrier" by Tamora Pierce for FREE! Bad poster 286 Another book cover desperately needed! 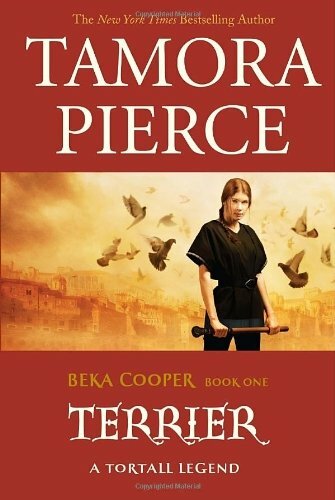 Series : Book 1 of "Beka Cooper"
Tamora Pierce begins a new Tortall trilogy introducing Beka Cooper, an amazing young woman who lived 200 years before Pierce's popular Alanna character. For the first time, Pierce employs first-­person narration in a novel, bringing readers even closer to a character that they will love for her unusual talents and tough personality. Beka Cooper is a rookie with the law-­enforcing Provost's Guard, and she's been assigned to the Lower City. It's a tough beat that's about to get tougher, as Beka's limited ability to communicate with the dead clues her in to an underworld conspiracy. Someone close to Beka is using dark magic to profit from the Lower City's criminal enterprises--­and the result is a crime wave the likes of which the Provost's Guard has never seen before. From the Hardcover edition.